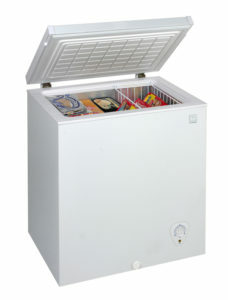 Chest freezers are a very old design which hasn’t been altered for 50 years. Usually, when a gas leak occurs in these units you will notice a lump of ice build up in one corner inside the freezer wall of the cabinet. Unfortunately, when this occurs it is the end of the unit and it is ready for hard rubbish collection no matter what age the unit is. The refrigerant or gas leak usually develops inside the walls of the cabinet and cannot be accessed without destroying the cabinet itself. When a compressor fails on a chest freezer unit it is quiet noticeable. Every 2-3 minutes buzzing noise will occur followed by a distinctive click and then silence for another 2-3 minutes. Compressor needs to be replaced for normal operation to resume.